As the weather is changing and winter fast approaches, we have already noticed an increase in car breakdowns and faults that are related to winter and the cooler weather. When did you last have a mechanic look at your car? Has it been serviced in the past year? Do you rely on your car as your main form of transport? 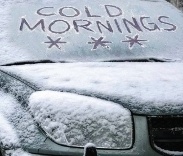 Cars need regular maintenance to perform at their best, if you haven’t had your car serviced in a while, now is the time to consider booking it in, before the ice arrives. Everyone knows how annoying it is to have an unreliable car, but its even worse to breakdown in during the winter, its no fun being stuck out in the cold. We advise all our customers to get their car serviced regularly, it ensures the engine can perform at its best, as clean oil does less damage to the internal system of the car. It will also highlight faults that need attention and reduce the risk of a roadside breakdown if these are fixed. Get in touch with us if you would like to book your car in for a service or repairs.